Arghhhh! It was time to figure it all out, the storage, the backups. NOT GOING TO HAPPEN AGAIN! I made a video for you with my BACK IT UP 3 TIMES process using an external hard drive for all my Lightroom files. The video below is the best I have come across to explain in detail how to move your Lightroom files. Simple, direct, easy. This video is great for creating a new Lightroom catalog on an external drive. Overlays used in the featured image are from the Pure Light 2 collection. As always, feel free to ask a question, by email or by commenting below. 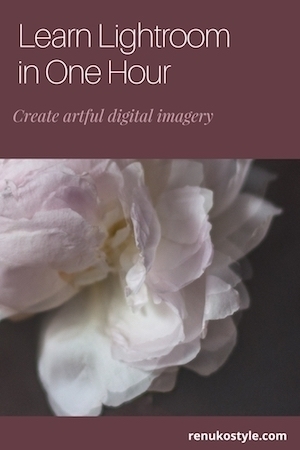 30% off Learn Lightroom in One Hour from Creative Biz academy. You are going to love Lightroom! Check your email to get the code. thank you Karen!!! I am ordering another external hard drive and will move my Lightroom Catalogs to that hard drive once it arrives. You have been so helpful, I can’t thank you enough. I’ll email if I have any further questions.